Happiness is a prize for overcoming. Exaggerated worries and fears fulfill a subconscious purpose. I can’t remember how often I‘ve heard this question from my clients within the past 30 years of my career as a therapist. The question usually came up once I had worked with the client for a while and it became obvious we were talking about an “old“ fear. Someone had been beaten or abused as a child or adolescent. He or she had a dominant father where the entire family subjected itself to this person. In the family of origin all that counted was performance and mistakes were mercilessly condemned to be a major failure. These experiences that were made under stressful situations can have the effect on some people that once they become adults they can lead to enormous fears. They get extremely panicky before their exams – even though they’ve achieved best results in all other tests so far. The internist finds an indication he cannot allocate clearly. Until it is clarified the patient is not able to sleep for three days. A company is losing sales volume and an employee indulges in all kinds of catastrophic worse-case scenarios in case he might be fired. You can almost always find the fitting background in psychotherapy, where the exaggerated fear has its roots. Bringing the subconscious relationship experience to a conscious level can help to handle fears that are currently experienced. But it often takes a long time and sometimes it also doesn’t help. It’s exactly what the US-therapist Barry Michels describes in his new book “The Tools”. Michel’s instructors and supervisors often said that, if the patients’ fears didn’t change then one would have to work on an even “deeper” lying conflict. He increasingly doubted this intervention though. He then encountered the psychologist Phil Stutz and developed these incredible methods – “Tools” – in the course of his professional life which showed an entirely new approach in treating clients. This book has really made an impression on me. It mainly contains five tools with which fears, worries, insecurities and motivational problems can be solved. It does not operate with the common methods but describes a completely new approach. In the following four weeks I will present you with the other four tools. 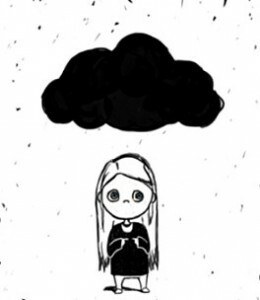 The “black cloud” of worries. When you’re under the “black cloud” everything looks dreary. Most people long for inner peace. That means they want to feel that everything is ok and everything has its right place. Nevertheless everyone worries about something from time to time, develops fears or ponders over the same things over and over – without finding a way out. What’s tragic about this is: of course on a rational level we know that the upcoming exam does not determine whether we live or die. We don’t seriously worry that our child may be lying injured in the ditch just because it hasn’t called when it should have. Or that the hammering headache is probably harmless and not necessarily a symptom for a brain tumor. But when fear spreads within ourselves, and pondering thoughts run circles in our heads or the worries about all sorts of things don’t stop, then we lose this realistic perspective. It’s as if we were standing under a “black cloud”. Then we imagine all the worse-case scenarios of what might have happened or what is bound to happen. All we can see is what’s going wrong: in our life, in our family, in the company, in the world. Emotionally things are terrible for the person in question – but only that person experiences this. Those around that person find it excessively exaggerated, roll their eyes and at one point will break off the contact. Especially since the anxious person can’t seem to be reached with any kind of advice, comfort or help. Why positive thinking doesn’t help. But the frustrating realization of the anxious reader is usually: mysteriously enough his or her negative thoughts always seem to be stronger than the positive ones – completely different from what the book promised or the psyched seminar leader proclaimed! Every positive thought that you try to tell yourself is attacked by the inner critic: “You can’t really believe all that nonsense, can you?” Or: “You honestly think this is going to work for you?” After a while you feel even worse than before, because you – as it seems – are obviously a hopeless case. The sense of “senseless” thoughts. Why is it so hard to stop with all the “unnecessary” pondering and worrying? In a silent moment we remember, that the last time we were out of our minds worrying about something that what we feared, never became reality. Why can’t we just learn from that? For example: It’s Saturday afternoon and you find some certified mail in your mailbox. You have no idea what the news could be. The post office is already closed. You have to wait until Monday to find out more. Thus an insecure situation where we have no control. People who tend to seriously ponder begin to worry so they at least have something to do in the meantime. They have the feeling that in doing so they are prepared for anything that may come up. That way they don’t feel helplessly exposed to the uncertainty. Usually the uncertain situation turns out to be harmless. The registered letter was about your online banking account to certify your personal data – and you had completely forgotten about it. People who have a tendency to be fearful and worry a lot have often experienced insecure situations during their childhood which they distressfully had to bear. Parents who quarreled a lot and the fear of separation was in the air. The mother who was very ill and everyone had to worry whether she would live or die. The father who came home drunk and became violent. Children who don’t have an adult to comfort them in those moments have to help themselves. They stand in front of a window for hours believing they have an influence on the return of their mother who had left the house during a fight. A child cannot handle this fear alone nor can it bear it easily. It cannot stand there not doing anything at all. But it can worry. And this calms down the fears somewhat. This is how you stop your negative thinking. The grateful flow helps against these grey thoughts. You have no control over the world around you and the incidents that come up. What you can control though is your mind, your thoughts. Of course this seems to be impossible when you are afraid of something or in the middle of worrying. That’s why I recommend you an utmost effective tool from the book “The Tools”. 1. Start by quietly thinking about all the things in your life you are grateful for. 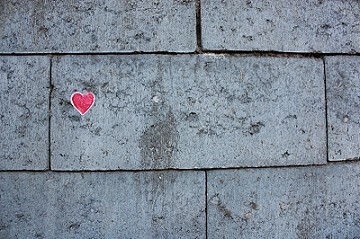 What counts is that you can really start to feel the gratefulness – and not only think about it. Keep finding new things that you are grateful for. 2. After half a minute in which you have listed things that you are grateful for you stop. Concentrate on the feeling of gratefulness in your body. Soon you’ll feel it coming from your heart. 3. Once you feel the gratefulness in your heart, imagine that your gratefulness belongs to a higher power which takes care of you and the whole planet. Get connected with this source. Don’t worry, I felt the same way when I read the book “The Tools”. Two experienced psychoanalysts, one of them a prison psychologist, start talking about higher powers. Another esoteric method? The successor to “The Secret”. What normally helps against hasty prejudices is making one’s own experiences. You may have read numerous scientific articles on the absurdity of homeopathy but the night your wife gives your child, that has been crying for hours due to a severe earache, five globules of Chamomilla and the child is calm ten minutes later – it might just change your attitude towards the inventors of those globules. And I’ve tried this tool. It helps if you have remorseful thoughts on things in the past. Why didn’t I sell all my shares last year? Why didn’t I begin to study psychology in the first place before trying out numerous jobs beforehand? What would the course of my life have been like, if I had…? So-called “mistakes” in the past only have an influence on your present life as long as you keep pondering over them. When you feel all the things you have and what you are grateful for you suddenly start to see the future with all its possibilities and chances. It sets you free from self-hatred. Everyone knows the inner critic who always has to add its two cents to everything. You can never win against this inner voice, if you get involved in the debate. You need something that is stronger than your “inner critic”. And this tool is it. Try it out. It keeps us from judging others. Usually we devaluate others when we think we cannot withdraw from their disturbing influence. Others feel if we judge them and they will most likely start treating us differently. They actually become more unfriendly and there you have your self-fulfilling prophecy. If you are not religious you might find it hard to be thankful for things you believe you‘ve made happen with your own strength. Or believing in a source in the universe that takes care of everything. Take a short break and think about your body for a moment. For the last minutes it’s been busy filtering oxygen from the air, digesting food and has enabled you to read this and think about it. All of this works without you having to actively do anything. You probably don’t even know exactly how your body does all these things. Or think of our planet earth. Even though we humans are not treating it diligently, it still provides us with food, air to breathe, raw materials which among others your smart phone or laptop were made of which you are reading this article on. Start feeling it, too. With your grateful heart. Here you also can listen to this article. What experiences have you made with this exercise? ← Why many men stumble over the umbilical cord in their relationships.